Know that your loved-ones understand what to do during an emergency. Ensure the best chance of being reunited after a disaster. Reduce risk to your business and protect your employees. Are you prepared to handle a crisis? Will you remember what to do during times of high stress? An emergency plan is essential to your disaster preparedness. Emergency Plan for iPhone is a useful way of making sure your family and colleagues have the important elements of your plan with them at all times. We’ve developed an app version of the emergency plan card recommended by preparedness organisations worldwide. It is intended for the immediate unfolding of a crisis. Emergency Plan helps family members set pre-prepared procedures, contacts and meeting points in the event of an emergency. It helps businesses reduce risk by making sure employees know how to react to urgent situations in the workplace. provide employees with a summary of your Business Continuity Plan. Your phone is a constant companion so use Emergency Plan for iPhone to keep vital details ready wherever you go. It is designed to be intuitive and features standard iOS controls to avoid confusion during times of high stress. If you are comfortable with other iOS apps, using Emergency Plan for iPhone should already be quite straightforward. There are many emergency and preparedness apps available but Emergency Plan for iPhone focuses on allowing you to save the procedures appropriate for your family or work environment. Its straightforward interface delivers only the important information without unwanted distractions. Emergency Plan for iPhone is all about helping you create, save and share your emergency plan efficiently. A freeform section lets you save a plan that’s appropriate for your household or workplace. Email your plan to an address book contact. Show a shortlist of emergency contacts from your address book. 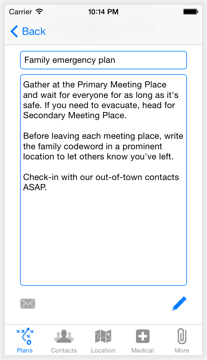 Set primary and secondary meeting places to gather during an emergency. Plot your current geographic location on a map. Keep medical information ready to pass on to healthcare professionals. Help and tips on creating an emergency plan. Easy editing and no superfluous eye candy to get in the way during an emergency. Put together a plan outlining the steps for ensuring your family is prepared to handle a crisis. A written plan distributed amongst members of your household will avoid confusion during the critical periods of an emergency. Enter meeting places, procedures and special notes in the free-form text area. Your emergency plan will be the first thing you see after opening the app. 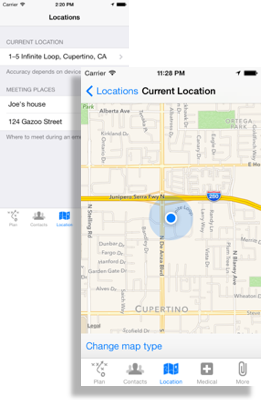 Use iOS Location Services on your iPhone. The map updated in real-time takes a reading of your current location. See the nearby streets so you can tell people how to find you. iOS Location Services depend on your device type, data plan, Global Positioning System (GPS) readings, cellular phone towers and WiFi network. While it’s not possible to guarantee that a reading during a large-scale disaster, it can be a handy for those every-day emergencies like a car-breakdown or getting lost in an unfamiliar city. A paper map is still the most fool-proof navigation tool but why not use technology if it’s available? Due to the features used in this app, it is only available for iOS 7 devices.